There is one place near to the town of Tasiilaq where the central Greenland Ice sheet comes down to and meets the coast. "Near" of course being a relative term as this is Greenland after all and it took 2 hours on a very bouncy open boat with an outboard engine to get here. 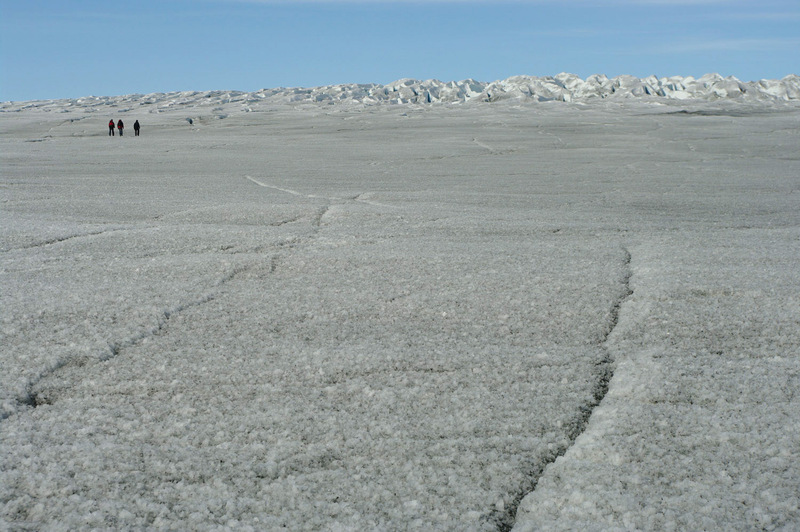 If you walk in the direction that the three figures are heading, then after about 300 miles (480 km) you will reach the west coast of Greenland, well almost, there's a ribbon of ice-free land around most of Greenland except for a few places such as here. Apparently there is an annual race across the ice-cap that starts here if spending a couple of weeks on cross country skis looking at an ice cap everyday is your thing. Photo; © Paul Ward - These are pictures taken while travelling in Eastern Greenland in the Arctic summer.